ATX Radiant Barrier & Insulation serves the great residents of Cedar Park, Texas. We are a family owner and operated company serving the Austin area for over 10 years. We have many great relationships with the folks in Cedar Park and have successfully completed multiple attic insulation jobs in that area. We offer a FREE NO OBLIGATION quote for insulation for your Cedar Park home. Just fill out the form to the right of this page or on our contact page. If you are on mobile, click any of the blue “Click to Call” buttons on our site to connect immediately to one of our friendly sale staff. We are here to help you and will make sure you get the best bang for the buck in your Cedar Park home insulation installation! Like your Austin counterparts residents in Cedar Park suffer from similar conditions with weather and climate that affects their attic insulation. With ATX Radiant Barrier & Insulation’s wide variety of attic insulation solutions, we are confident we have the right fit for both your home and your budget. Your attic system works in unison with each other to maintain a comfortable quality of life in your home daily. Your attic system consists of your roof, insulation and HVAC system. If you have insufficient or faulty insulation up in your attic, this causes your AC unit to work harder to keep your home cool in the summer and warm in the winter. The results being that your AC system works harder (which shortens the lifespan of the AC unit) and it stays on longer to maintain the temperature you want your house at in order to feel good, which, in turn, costs you more money each month. With proper insulation installed in your Cedar Park home, you now give your AC system a bit of a break because your house is able to hold in that heat or cool air keeping your home comfortable throughout the year and putting money back in your pocket. ATX radiant barrier & Insulation’s products will insure that your house is comfortable and lower your electricity usage by at least 18% and up to as high as 40%! The only thing you have to do is figure out what you’re going to do with that extra cash in your bank account each month! We have many more products which can be found by CLICKING HERE. friendly knowledgeable staff will get right back to you. 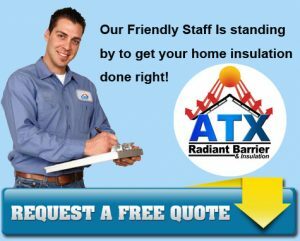 Our primary goal is it see that every home has proper and adequate insulation, whether you buy from us or not, but we know that with ATX Radiant Barrier & Insulation your home will be done in a timely and professional manner. We look forward to serving you! Look, I’m sure our competitors in and around the Cedar Park area can all install attic insulation and they probably do a decent job. But we’re the Cadillac of insulation companies. If you care about the little things — like having professional, well-dressed, proud, blue collar insulation pros show up to your door 15-minutes early… as opposed to Joe the insulation dude, who mopes to your front door 30 minutes late, looking like he just came off a three day bender, shirt screaming, “Joe, I don’t fit you!”… then you should definitely call us by clicking below. Like most things in life, you get what you pay for. Attic insulation is no different. We hear from our Cedar Park customers that so and so is offering insulation cheaper. Insulating your home is aninvestment in both your home and its value down the road. It is a product that will cut your energy costs by up to 40%. Say your monthly bill is around $200. A savings of 40% is $80.00! That’s $960.00 per year! Think of what you could do with an extra $960 in your pocket! So when a company tries to sell you cheap insulation, you need to see the bigger picture of what it will cost you down the road. If you go with them, it won’t hurt our feelings, we don’t have to live in your house! You do! Our advice is get the best insulation you can afford, whether or not you buy from us. The bottom line is the insulation MUST do the job it is designed to do, otherwise, you’re just throwing that money out the window (literally) every month that you house continues with faulty or sub-par home insulation. What Makes a Good Austin Attic Insulation Company? What’s the Best Attic Insulation Type for Austin, TX?